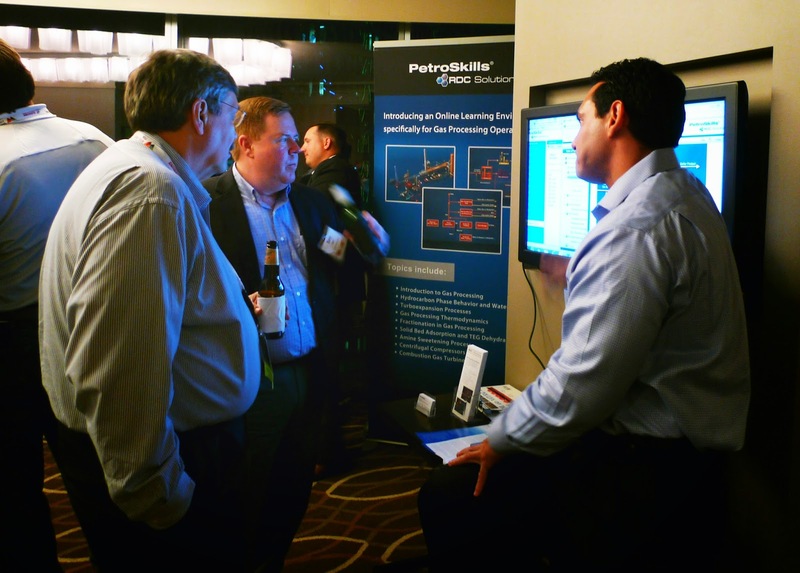 RDC Solutions introduced the latest in the ePILOT™ Unit Operations at the Gas Processors Association Convention in Dallas, April 13-16. Jesse Garza was on hand in the PetroSkills hospitality suite to demonstrate the new online courses based on PetroSkills gas processing content. The Gas Processing Operations web-based learning modules provide the fundamentals as well as in-depth coverage of all topics related to gas processing to help develop a highly qualified workforce. Critical information for operations, systems, equipment, instruments, fundamentals, and process safety are incorporated in the online learning environment. PetroSkills | RDC Solutions has worked together with industry SMEs to identify all knowledge requirements specific to gas processing operations. Applying proven instructional design methods and advanced web technology creates an effective learning solution that delves deep into gas processing equipment and operations. This dynamic learning environment incorporates critical information for operations, systems, equipment, instruments, fundamentals, and process safety in a sustainable environment that is available online, anytime and anywhere, to develop and maintain a highly skilled workforce. More information and a list of topics can be found on the website. RDC Solutions announces the addition of 2 new web-based learning programs to the ePILOT™ Core Competency Library. Understanding Electricity is added to the "Fundamentals" category, and Corrosion Control is added to the "Product and Process Quality Control" category. Contact your RDC representative for assistance accessing these courses. This course covers how to safely work with electricity. This course includes basic electrical terms, the effect of electric current on the human body, and why electricity is a potential hazard. Additionally, students will learn about grounding electrical equipment, the proper precautions to take when working with electrical equipment, and how to act in an emergency. The Electric Power Distribution System section describes how electric power is distributed. Students will also learn about measuring electric usage, including units of measurement and how to read a meter. 1122 Corrosion Control Millions of dollars are lost each year to corrosion. Millions more are spent attempting to control it. This program will teach you the basics of the corrosion process, the methods used to monitor the rate of corrosion, and the control techniques used to protect equipment. By successfully controlling corrosion, the destructive effects can be minimized, and facility operation can be more profitable. Through the ePILOT Libraries, learners have anytime access to over 400 hours of training in a secure, hosted online environment. All ePILOT courses have been certified to stringent e-learning standards by the American Society of Training and Development (ASTD) and by the American Petroleum Institute (API). ePILOT is the first web-based operator training curriculum certified by the International Association for Continuing Education and Training (IACET), allowing learners to earn Continuing Education Units (CEU).